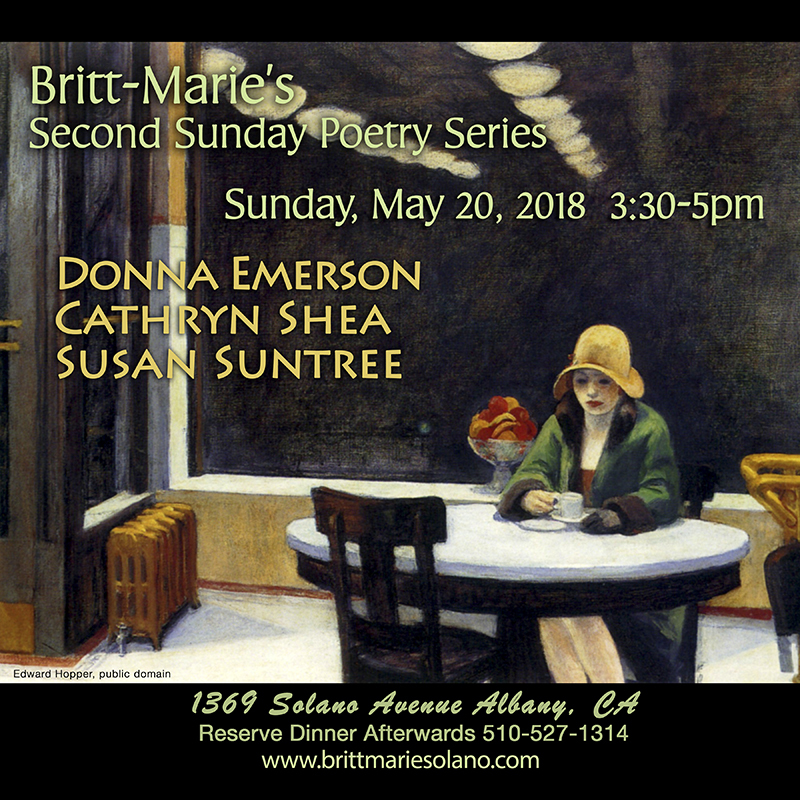 CHANGE OF DATE: My reading at Britt Marie in Albany is happening on Sunday, 20 May at 3:30 (see the poster below)! Sorry for the confusion! I hope to see you there. 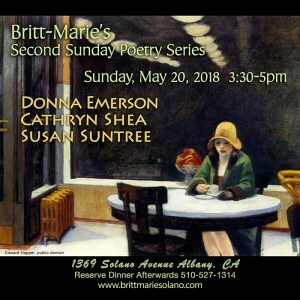 Britt Marie is one of those beloved restaurants that people regularly return to. It was bought a few years ago by a former student of mine. Timo Rodriguez was a memorably smart, lively unto wild young man attending one of my remedial writing courses at East Los Angeles College. He went on to earn a PhD at UC Berkeley, but tiring of academic life, bought Britt Marie and introduced a poetry series among other lively additions to the restaurants great food and ambiance. Plan to stay for dinner! Good News: My adaptation as a poem of the Universal Declaration of Human Rights, set as a choral work by award winning composer Adrienne Albert: A Choral Quilt of Hope, will be sung in Kansas City this summer. They will sing the Preamble and plan to present the complete work later this year. We hope to see this work sung across the country and, in translation, around the world, so people will embody the UNDHR’s vision, articulated so long ago, of peace and community benefit for all. Good News: Our efforts to create an Historic 11th Street Bungalow District moves forward. We received a strong letter of endorsement from Pasadena Heritage, one of the foremost conservancies in the country.